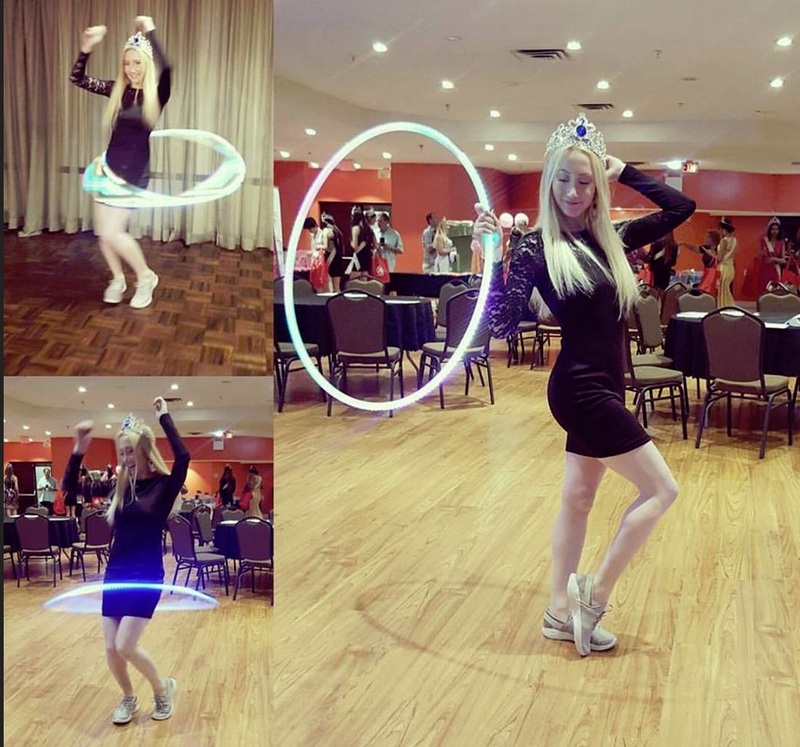 On a hot summer night in July, Spin Starlet (Sam) traveled to the Edward Hotel in North York Ontario to show off her special skills as a show stopping ‘sharable moment center’ at a private party full of aspiring celebrities. She was invited, and did accept, a chance to meet and perform at the 2017 Miss World Canada Welcome Party. Miss World Canada is a beauty pageant, held annually in different incarnations since 1957, to select Canada’s representative to the Miss World contest. On that ‘first night’ of their six day stay in the city, the delegates from all over Canada met and ‘partied’ together in the Edward Hotel ballroom. In addition to their special edition provincial sashes and blue-gem encrusted silver crowns, all seventy regional delegates received gifts from twelve sponsors. The gift bags included beach-wear, bubble baths and soaps, hair sprays, perfumes and tooth paste and floss from local dentists. Sam’s station didn’t give away anything, but yet its where all the delegates gathered taking pictures of each other all night. Like these snaps of Miss World Halton Region 2017, on Instagram. Sam Starlet performed for, and then taught a great many of the Miss World Canada delegates how to be better hula hoopers that night. She amazed everyone with her own hooping skills, and then inspired the others to try her tricks. Together they all shared many wiggles and giggles and now Sam’s image lives in each of their phones as part of their 2017 Miss World Canada pageant memories. Sam actively entertained over fifty contestants, and one by one they all fell in love with the hula hoop. We expect some of them will continue to use it to keep fit. Hula hooping is good exercise for beauty pageant delegates as it hones balance and sharpens mental acuity. Such activity is excellent for toning arms and legs and even the most basic hula-hooping movements burn calories as they exercise the muscles in your midsection. To the pageant administrators: Thanks for having us and see you next year.